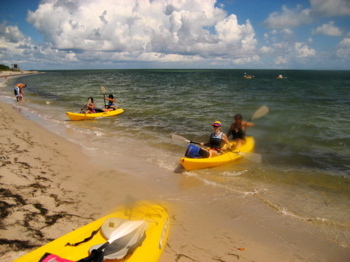 My wife and I finally got the chance to partake in the Crandon Park kayak and snorkeling tour. Previously, we took the hour drive to John Pennecamp State Park for snorkeling (great trip by the way!) but Crandon Park is much closer, it’s only fifteen minutes away from South Beach. If you are limited for time this is a great way to see South Florida’s outdoors. I called the EcoAdventure Tours office on Friday (305-365-3018) and we made reservations for the 9:30am – 1pm trip the next day (Saturday). It was an easy drive on Saturday morning from South Beach to the Eco Adventures office in Crandon Park. While we were waiting for the tour to begin, we visited the Eco-Tour’s museum room. They have a great variety of hands-on exhibits for kids and adults!. Our two tour guides went over the basic instructions on snorkeling. We paid for the trip ($50 a person, local residents $35) and headed out to the beach. 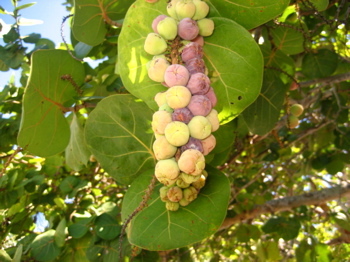 Along the way, our guide R.J. stopped to show us the edible sea grapes. They are about the same size as regular grapes but taste somewhat like a tart plum. Good to remember if you are ever stranded on a desert island! The guides demonstrated proper kayaking technique and we climbed aboard our tandem kayaks. We paddled north along Key Biscayne to Bear Cut Preserve, the site of a fossilized mangrove reef. We donned our snorkeling gear (it’s provided by the tour guides) and swam around the reef. 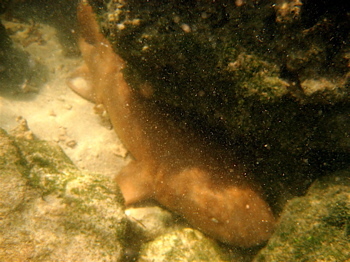 My wife quickly spotted a nurse shark tucked in the reef. 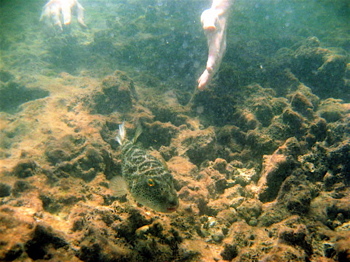 We had a great time snorkeling around finding colorful fish. 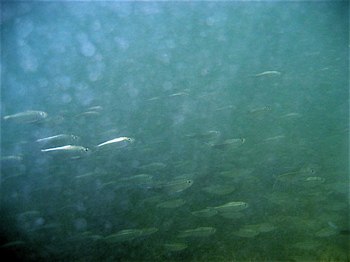 I especially enjoyed following the large schools of 2 inch long silver fish! After about 45 minutes of snorkeling we were getting tired so we loaded our snorkeling gear back on the boats and with the wind at our backs paddled back to the launch. It was a nice trip and we were back in South Beach by 1:30 in the afternoon. If you enjoy the beach Crandon Park is a great beach with picnic tables and palm trees right on the beach. The park also has a great network of paved trails for walking and biking if you would like to explore more of the park on your own. This featured article was written by Hunson, a website member at MiamiBeach411. See more articles by Hunson. 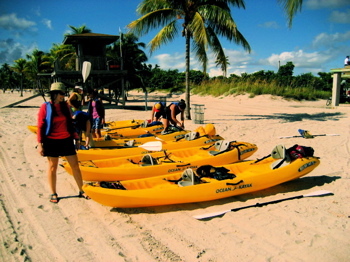 "The Closest Snorkel Trip Near Miami: EcoAdventure Tours on Key Biscayne"
GREAT PICTURES HUNSON!!! Looks like you had a fabulous time! Thank you for the information. The photos are beautiful, too! I haven’t been there before; now I want to go. I went on this adventure as well with my family and had a great time! Some of the best snorkeling I’ve ever done!! I especially liked holding the sea cucumbers and seeing the HUGE starfish!! The ocean kayak was a lot of fun as well! I highly recommend this and can’t wait to go back! WHY WOULD YOU DELETE MY COMMENTS YOU N00B!? YESSSSSSSS MY COMMENT IS STILL HERE! hi! the pictures are amazing and so is the story - I’ve always wanted to try snorkeling but I didn’t know how to organize everything. now I know, thanks. and just one stupid question -how did u take the pictures? I mean you’re not able to take your usual camera with you - it’ll get wet? South Pointe Park on Miami Beach has recently been renovated. Weather and conditions permitting there is a lot of sea life to see as well. I saw an amazing spotted eagle ray. Remember to bring a snorkel/dive flag. The life guards require them. All in all the Pennekamp Marine Preserve is still worth the extra drive. It is only 50$ person? How long is this trip?